/ 2-Part Blog / INSERT VS. FULL-FRAME WINDOW INSTALLATION: WHICH IS BETTER? INSERT VS. FULL-FRAME WINDOW INSTALLATION: WHICH IS BETTER? Proper installation is key to long-term window performance. But apart from proficiency, the very replacement method used matters, too. There are many ways to replace windows, but the most common kinds are insert and full-frame window installation. The former only involves setting new units into the existing frames whereas the latter requires the replacement of the entire window. In Renewal by Andersen® of St. Louis’s book, the use of the insert is the more attractive choice since it’s less disruptive and costly. However, it may not apply to your situation when your old window sill and frame are no longer square, solid and in good repair. Sometimes, the existing construction doesn’t lend itself to insert windows installation because it’s excessively leaky. When the damage to the old frame is beyond repair, full-frame replacement is necessary to guarantee structural integrity and prevent air infiltration. But then again, structurally sound, old frames don’t necessarily qualify for insert window installation. If the size of your existing wall openings doesn’t meet the latest fire egress codes, full-frame replacement is required. What to Expect From Renewal by Andersen®? Count on us to install your double-hung, bay, bow, picture, sliding, specialty and casement windows properly. During your in-home consultation, our representative will evaluate your existing units and assess the condition of their frames, sashes, casing and trim. We’ll look for visible structural issues and note unforeseen ones to prepare our installers. Two of our experienced specialists (design consultant and project technician) will inspect your existing openings thoroughly. With our proven local reputation, you can bank on our strong attention to detail for the appropriate window installation method for your project. 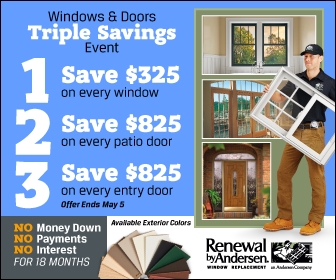 At Renewal by Andersen of St. Louis, our precise evaluation and installation processes ensure your energy efficient windows will perform as expected for a lifetime. Let’s get your project rolling. To discuss your Missouri window replacement, call us at (314) 332-2364 to schedule your FREE, in-home consultation in St. Charles, MO, at your convenience.